First of all I love how Barry M have taken their name "Speedy Quick Dry" and made this into a racing theme; the lids have a black and white chequered pattern, just like the flags in motorsport. Then there's the names; I have In a Heartbeat (pink with a peach undertone), Lap of Honour (dusky lilac) and Road Rage (mint). Other shade names include Pit Stop (light but bright green), Pole Position (grey with a subtle purple undertone) and Full Throttle (pastel orange), with 9 in the range in total. 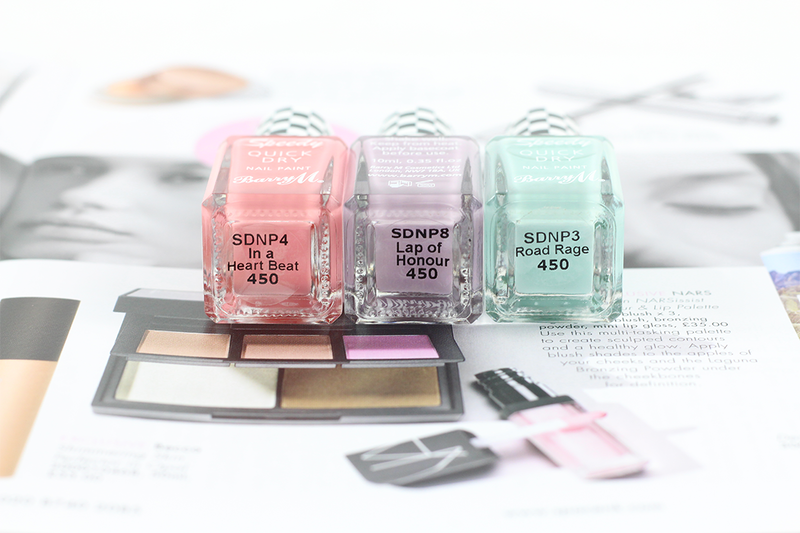 All the shades are very much on the pastel spectrum, so if you're not a fan of neons then these will be perfect for your Spring and Summer collection! What also makes the Speedy Quick Dry range stand apart from the rest is the new brush - it's much wider and flatter, which is my favourite type of nail brush! It's so much easier to apply the polish evenly and quickly; I run the brush down the middle first, then down each side in three simple swipes before going onto the next nail. Now onto the actual formula... After about 45 seconds you can touch the polish lightly without disturbing it, but it's still tacky. Another 15-30 seconds and it's pretty much dry, so I'd say that these polishes do live up to their speedy dry claims. My only gripe is that the polish is quite thin and therefore is so streaky when applying! I guess the consistency is part of what makes the polish dry quickly, but I felt like I needed 3 coats with each of the three shades I have to get a truly opaque and even colour. Find the full range online at Boots here. 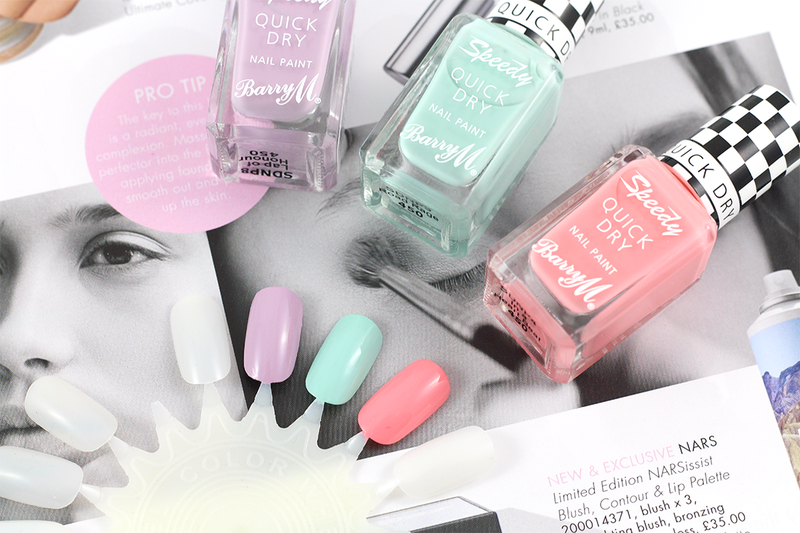 Will you be spending your pennies on any of the Barry M Speedy Quick Dry Nail Paint? Which shade is your favourite? I never really look at nail polishes, I've been a nail biter since I was tiny so I never see the point but oh, my goodness road rage is beautiful!